I have never been big on New Years resolutions although I like the concept. I think setting goals is extremely empowering and worth it even if you only reach a small percentage of what you write down. After a gig in Austin last year I stayed an extra day in Austin and attended a “mind mapping” conference. I was taught mind mapping by Charles Maclnerney a yoga guru who explained the concept to me in a remarkably simple and brilliant way. Early in school, right from the get-go we are taught to write on standard issue notebook paper. We are encouraged to write within the margins and to “stay between the lines”. Any aberration from this protocol and we are given “points off” for deviating and scribbling outside the lines. If you think about this it’s interesting how early we are conditioned to conformity and compliance. We are basically punished for being out of line and thinking outside of the box. 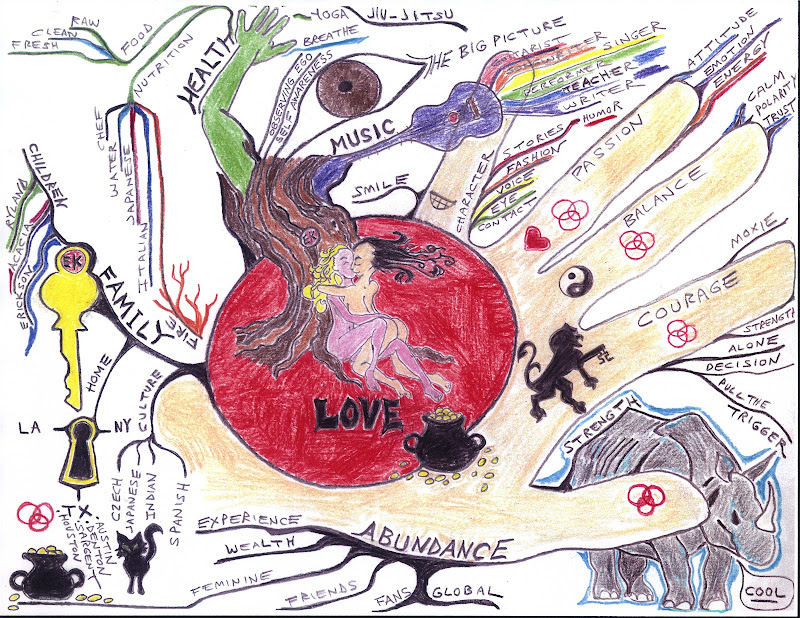 This is where mind-mapping can be so fun and empowering. In mind-mapping the goal is to tap into your creative potential and to do so in a non-linear fashion. Tony Buzan who who conceptualized and developed Mind-Mapping explains it so well, I would like to share some of his concepts with you. The brain is structured like a tree. Each neuron branches and connects with hundreds of other nerve cells, each of which in turn branches and connects to hundreds of additional cells, forming and intricate web of connections. Because of it’s structure, the mind loves to associate. My Mom who was valedictorian of her class taught me the power of association. Every thought, word and concept-meaningless in itself – is understood in terms of the myriad associations it carries with it. Every thought, every word every concept, has the potential to trigger a multitude of associations, each of which can trigger another multitude of associations in an explosion of new perspectives. Simultaneously experiencing life through all of the senses-sight, sound, touch, smell, taste-the human brain processes information in both left and right hemispheres, front and back, consciously and unconsciously. This is natural. This is what the brain does best. This infinite complexity is what sets us above and beyond the computer. No matter what the geeks say, your brain is much more powerful and capable than any computer anywhere. Traditional linear note-taking and note-making – the ordered list, the check list, the outline – work at cross purposes to the natural tendencies of the brain. They reduce a list of possible associations down to one (the first, and quite often not even the most important one) which in turn is linked to just one more word, again and again, to form linear sentences, paragraphs etc. A myriad of possibilities is collapsed into a singular linear path. Because the brain rebels against being hemmed in like this, it will find something more interesting, such as an insect on a window pane, or else fall into a trance. All too often students forced to learn linearly come to associate learning with boredom and frustration. Mind-Mapping was designed to take advantage of the natural tendencies of the mind rather than to try and rein them in. Mind-Mapping takes advantage of the full associative power of the human brain. Some of the greatest minds in history, such as Einstein and Leonardo Da Vinci constantly combined words, pictures, diagrams, and doodles to help them unleash the creative power of their minds. The capacity of the human to store and recall pictures is virtually unlimited. In 1970 Ralph Haber published a paper in the Scientific American, 105, May 1970, titled ‘How We Remember What We See’. In this paper he described an experiment in which subjects where shown 2560 photographs, one very ten seconds over a seven hour period. Later they were able to recognize those pictures with a 85-95% percent accuracy. Haber later repeated the same experiment, this time at high speed (one picture per second), and when testing for recognition showed mirror images of the original pictures without any loss in performance from the first experiment. 1. While drawing, you are waking up a whole area of your brain (the visual cortex) that is usually dormant. By bringing it to bear on a task, along with ALL of the other senses and functions of your mind you generate a synergistic and creative storm of associations and intuitive insights. By the way the little cat you see in the left hand corner of my “Mind-Map” just showed up in my life. After careful consideration we named her “Lid-Beh” This is a picture of her. It was eerie to see how she looks just like the cat I drew in my Mind-Map six months ago. Me and my friend Allan Holdsworth were talking about how both of the guitars we desired just showed up in our lives after we “pictured” them. 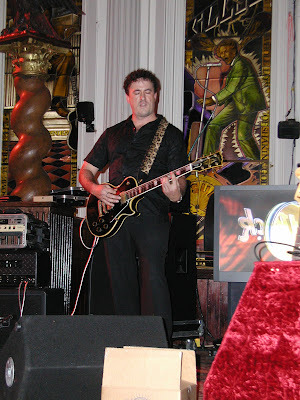 I always wanted a Black Gibson “Les Paul” I even drew a picture of me playing one. A guitar teacher I had in high school offered to sell my mom the exact guitar I dreamed of for $175 dollars a few months later. Here is a photo of my Mind Map. I encourage you to create one yourself and contact me if you have any questions. The first rule of Mind-Mapping is that there are no rules!